Decent performance for the price, but already outclassed. 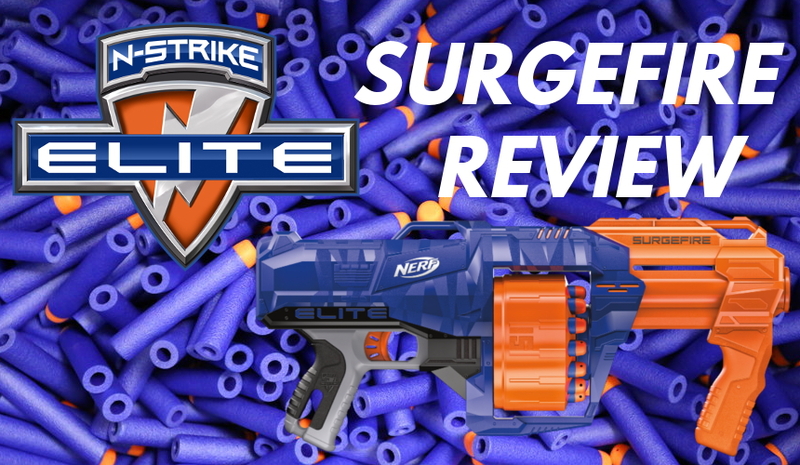 By and large, the Nerf brand has embraced the magazine for its flagship products. Cylinders have largely been relegated to roles in pistols or specialized roles (Mastodon, The Judge, etc). In the case of the Surgefire, however, Hasbro has released a fifteen-shot blaster at a primary-type price point. It performs up to Elite standards and works well in practice, but is it too little too late? 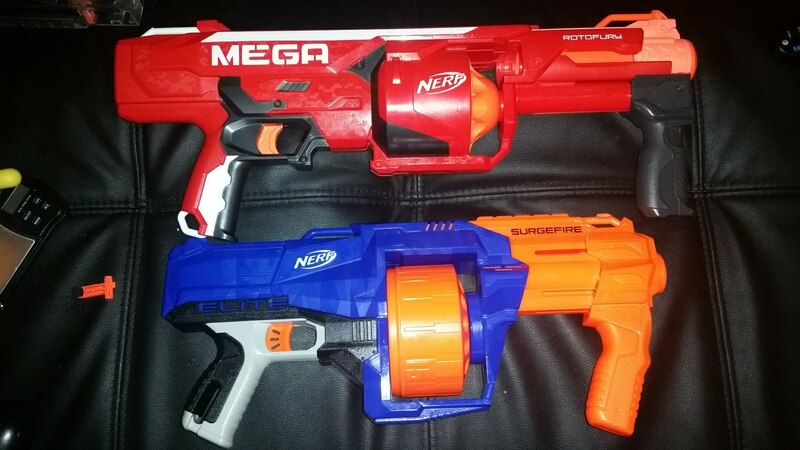 The Surgefire keeps the same form factor as the Mega Rotofury, but with a less boxy shell. There is no stock or stock attachment point; the Surgefire is very much sized for firing from the hip, almost like a Tommy gun from one of those old gangster movies where none of the lackeys know how to actually use a firearm. 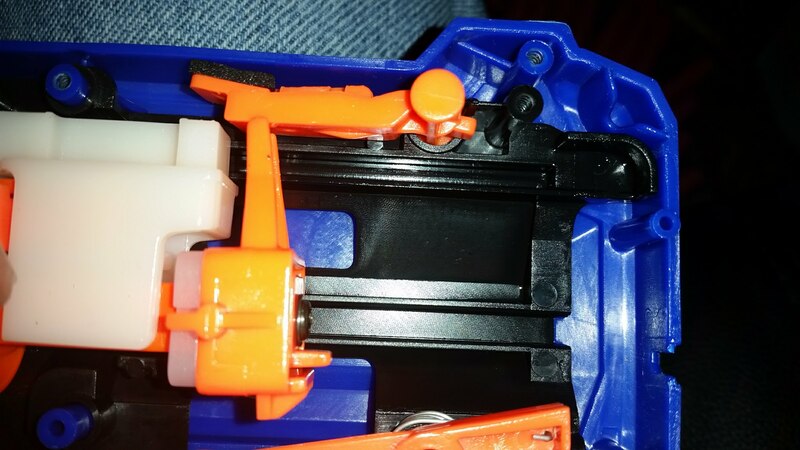 The drum on the Surgefire is separate in the box, and designed to snap in (it is not meant to be removed). It’s fairly small, not adding much width to the profile of the blaster, but it seems like it could’ve held four or five more barrels with ease. However, that’s mainly from being spoiled by things like the Magnum Superdrum, which crams as many barrels together as humanly possible. The handle and priming grip are both large and comfortable to use for extended periods. On the inside, the Surgefire has largely the same internals as the Doominator, minus of course the complicated and unreliable rotation carriage. A plastic bar extends from the top of the priming handle to the rear of the blaster. The slamfire mechanism is naturally included. For those looking to mod, the Strongarm/Doominator plunger setup isn’t nearly as robust as those in the Retaliator and similar blasters. It works well, but doesn’t like to last with extra force. The drum rotation seems very reliable. Even so, there’s an extra mechanism at the front of the drum for centering the barrel with the plunger tube. Perhaps that really is necessary? Hasbro doesn’t usually add extra plastic mechanisms on the inside without a reason. The one thing I removed on the inside is this piece, which keeps you from pumping an already primed blaster. The orange lever drops down in place after priming, and then gets moved up by the protrusion above the plunger. However, I like being able to pump a blaster to rotate the cylinder, especially when I’m reloading. Why abuse the slip gear on the cylinder by rotating the whole drum by hand? But Does It Have the Heart? Performance is at a respectable average of 71fps, on par with Elite blasters in general. In a war setting, it performs as well as can be expected from any stock blaster. 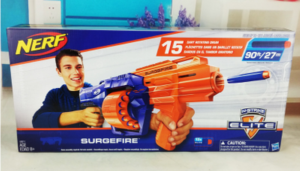 The Surgefire’s smaller size and relative lack of sound (especially compared to electronic blasters) make it useful for indoors, or any place with appreciable cover. 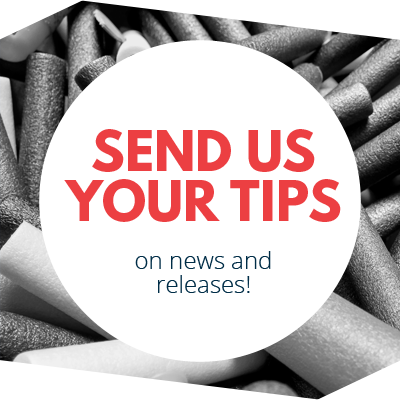 As a cylinder-fed primary, it also has easy reloading on the fly. If you play lightly equipped (as some players do in both wars and HvZ events), you might want it. For the price, the Surgefire is a decent stock blaster. But it seems like too little too late when there are so many other options, like the Dart Zone Magnum Superdrum (forty shots at 80fps+ for $20). The Xshot Turbo Advance has a similar setup and performance, but with forty shots, for $20-$30 depending on store and the number of darts (often over 100 included). Completely ignoring modifications, the Surgefire is already outdated. Time will tell if the Surgefire sees widespread adoption. It does, after all, have the Nerf brand behind it. 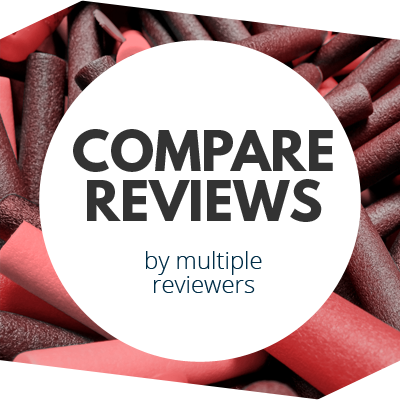 This entry was posted in Dart Blasters, Reviews on December 20, 2017 by BuffdaddyNerf. 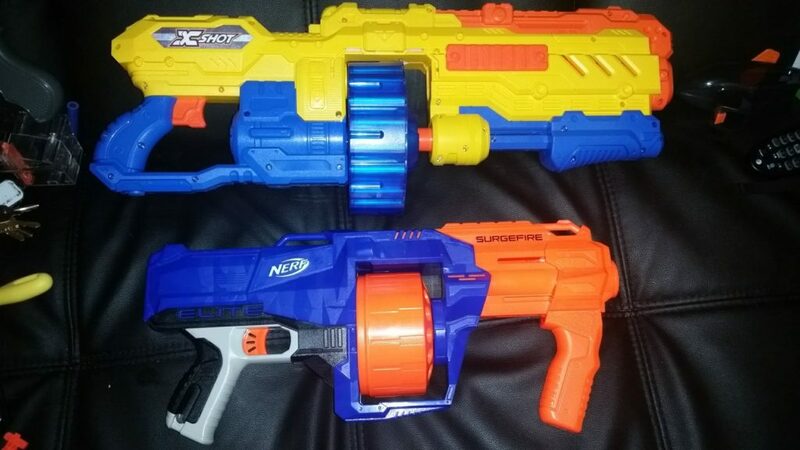 I originally wanted an Alphatrooper pretty bad, but it suffered from a downside I often fear off off-brand blasters. It felt too fragile. The AT felt flimsy, but is also prone to jamming unless you prime it rather roughly. This ruined any utility I saw in a springer magazine fed primary. The Modulus Recon is good for what it is, but the dorsal primer relegates it to a bulky magazine pistol sans it’s attachments (put the stock on a Stryfe instead). The Surgefire seems to do everything right for a springer primary. It feels robust, solid. If it feels like it could probably be used as a club (please don’t tho!) and come away okay, then in my mind it’s a good blaster because it can survive the rigours of hectic Nerf wars. The barrel offers quick on the fly reloading (although the barrel seems to resist being turned by hand, making the author’s mod perhaps almost obligatory for maximising performance), the ergonomics are good and the styling aint to shabby either. I feel you’ve been a bit pessimistic on it’s place in the Hall of Blasters. 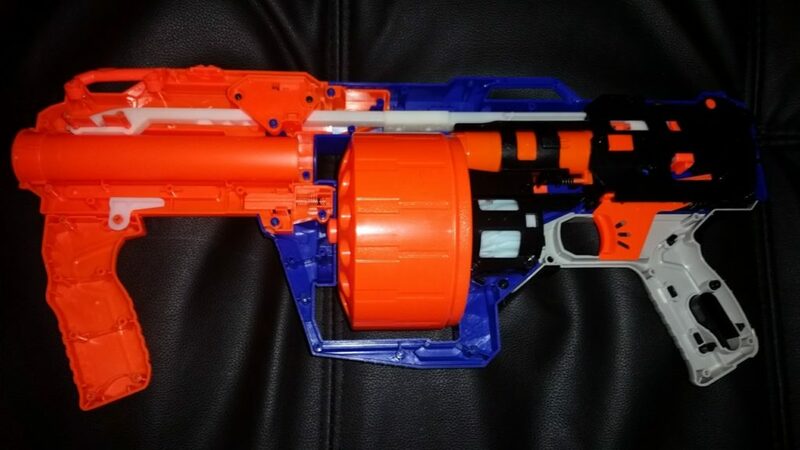 I can see this blaster being popular for everyone outside of the flywheel master race, and the reassurance of quality implied by the Nerf name should help it overcome preceeding off-brand competitors.